Combine 1/2 cup of Japanese soy sauce (shoyu), and 1 tablespoon of Mirin; put salmon on the grill, and when nearly done (the flesh will begin to become opaque), brush the sauce on the salmon generously, then return it to the grill and cook until it browns. When that side is done, cook the other side the same way. Note: Japanese Shoyu is made of wheat and beans; it may be obtained in whole food markets or in the International section of the supermarket. Mirin is a cooking wine. These are most important ingredients for Japanese cooking. Sauterne may be used instead of Mirin if a teaspoon of sugar is added. To dress the salad, combine 4 tbsp. peanut or light olive oil, 1 tbsp. 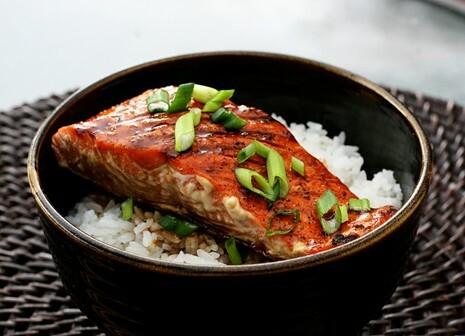 rice wine or red wine vinegar or fresh lemon juice, 2 cloves crushed garlic, a pinch of hot pepper flakes and 1/2 tsp. sea salt.